Food characteristics that matter to some intermediary buyers or consumers now include specifics of the production process (e.g., use of chemicals, geographic location of the farm, or treatment of farm animals), perceived fairness of marketing arrangements to farmers or farm laborers, and perceived implications of production and consumption of the product for the environment. New demands on producers and marketers have been met by innovative market responses that have expanded consumer choices. For example, more food is now marketed as locally grown, and niche producers and marketers have emerged to meet demands for free-range meats and cage-free eggs. However, one response to emerging buyer interests in food products can actually reduce consumer choice and increase food costs. Our recent research shows that a common result may be that restaurant chains, food-service operators, or grocers offer only a limited number of food items produced using tightly specified processes instead of offering a selection of products with alternative bundles of characteristics. Intermediary buyers have long specified the observable attributes of the products they seek to acquire, but now some are seeking deeper involvement in the production chain by specifying production and marketing practices such as traceability, environmental standards, animal-welfare requirements, labor standards, and other means to meet “sustainability” criteria. Such actions may be motivated by demands of final-product consumers, but they also seem to be inspired by external pressures from groups such as the Humane Society and notions of corporate responsibility, even with limited demand for the practices by the final-product consumers. Examples of buyer restrictions on animal production practices include requiring cage-free eggs and pork products produced without the use of gestation crates and with specific limits on the use of antibiotics, including for growth promotion or disease prevention (GPDP). Burger King, Hyatt, and Sodexo have announced that they plan to sell only products made from cage-free eggs. Chipotle sells only pork that it claims is “all-natural,” and “antibiotic-free.” McDonald’s is contemplating related standards for its suppliers. Restaurant chains such as Applebee’s, Denny’s, and grocery retailer Safeway are among key buyers embarking on a program to eliminate gestation crates from their pork supply chains. Examples of restrictions on products made from plant materials include General Mills requiring non-genetically modified inputs for its Cheerios cereal, Post doing the same for its Grape-Nuts cereal, and Walmart announcing recently that it has joined the “fair food program” intended to guarantee better conditions for workers in Florida’s tomato fields and possibly other crops. Our study examined the case when intermediary buyers impose restrictive farm production practices and traces the economic impacts on producers and consumers. We applied the analysis to proposed restrictions on pork production practices, focusing specifically on the prohibition of use of antibiotics for GPDP. Restrictions on production practices increase farm costs. They also increase processor costs because they either require segregation in facilities that handle both restricted and unrestricted product or dedicated facilities for each type of product. The latter alternative increases procurement costs such as for shipment of raw and processed products and reduces opportunities for scale economies. Somewhat less obvious, but very important, is that the associated higher production and processing costs apply to the entire animal, although the share of the edible product utilized by buyers requiring the practice may be quite small. For example, a fast-food restaurant chain that requires pork produced without use of gestation crates or with restricted uses of antibiotics may require only that portion of the hog used to produce bacon and breakfast sausage–normally about 18% of the carcass weight of a hog. The smaller the share of the live hog used by these buyers, the larger the share of farm production that must be converted to the restrictive practice to meet a given share of overall demand. In addition, in order to elicit supply of product with the desired characteristics, the additional cost must be compensated entirely on the portion of the product purchased by buyers requiring the characteristics because the remaining production must be sold in the undifferentiated market, where it receives no premium. Costs cannot be shifted to segments of the market that do not require the restrictive practices because the higher prices would be undercut by competing sellers who did not participate in the restricted segment of the market and, thus, had lower unit costs. Thus, cost increases incurred by these intermediary buyers will be magnified on a percentage basis relative to the percent increase in production and processing costs on a whole-animal basis. The restricted and unrestricted segments of the market are integrated on the supply side because producers’ and processors’ can switch between the two production methods. Thus, impacts on price and profits will be the same for all producers of the commodity regardless of whether they produce for the restricted segment of the market or the conventional segment. Linkages between the two market segments insure that impacts of requiring restrictive production practices will extend beyond simply those producers, processors, and consumers engaged in the supply chain of the restrictive practice. Demand impacts hinge upon the share of consumers who are willing to pay a premium for products embodying the restrictive production practice and the distribution of incremental willingness to pay among these consumers. However, to date we have little evidence about how restrictive production practices affect demand facing intermediary buyers imposing such requirements. Indeed, we are aware of no studies that provide direct insight into settings wherein a seller only offers product satisfying the restrictive production practice. Most buyers requiring or considering such practices are multiproduct sellers–restaurants, other food-service providers, or grocers, for whom the products in question comprise a relatively small share of total sales revenue. Impacts on prices and sales for other products offered by these sellers can, thus, play an important role in decisions regarding imposition of restrictive production practices based upon how such policies impact consumers’ perceptions of the firm. Profit-seeking sellers will require the restrictive production practice if the net effect of demand-side impacts in terms of all its product prices and sales is sufficient to outweigh the higher costs that the seller will incur in purchasing product containing the restricted characteristic. Thus marketers may require the restrictive production practice even if it causes a decline in sales of the restricted product, so long as the sales and profit margin for other products it sells increase because the action enhances the firm’s reputation. The important observation from this reasoning is that restrictions on farm production practices imposed by profit-seeking intermediaries may significantly reduce sales for the products in question and, hence, reduce profits in the farm and processing sectors and welfare of consumers of the product, which invariably will cost more. Net costs may be imposed on buyers and sellers of a product to benefit market intermediaries in some of the rest of their product markets. To investigate these ideas further we developed of a stylized simulation model of the pork marketing chain, which was calibrated to fit current market conditions. We then simulated impacts on producers and consumers of a ban by key buyers on use of antibiotics for GPDP (“antibiotic-free” or “AF” pork for short) for pork products that they buy. The simulation model includes equations for farm supply of hogs, retail supply of pork products, retail demand for pork products, farm demand for hogs, and equilibrium conditions specifying market clearing in both the retail and farm markets. We also specified the share of market demand occupied by adopters of the antibiotic restriction and the types of marketers adopting the restriction, since usage of pork products depends upon whether the adopting firm is a fast-food restaurant, full-service restaurant, grocer, etc. Demand-side impacts are speculative due to the paucity of objective information from surveys, experiments, or market data that apply to this setting. We considered three cases. In case (1) consumers overall do not change the quantity of pork they would buy at any given price in response to some intermediaries requiring AF pork–i.e., no demand shift. Case (2) had sellers of AF pork experience an increase in consumer demand, with no change in demand for pork among sellers of conventional pork. This could come about, for example, from consumers who are unwilling to consume conventional pork, but who will consume AF pork. Based on some in-store surveys done by other researchers, the share of such consumers could range from 11% to 25%. Finally, case 3 focused on consumers who would consume either pork product, but would be willing to pay more for AF pork. In this case demand growth for an AF seller comes from its own customers whose demand for AF pork is greater than their demand for conventional pork, and from consumers switching to AF pork sellers. Of course some consumers who patronized the AF seller prior to its requirement of AF pork may switch to other sellers to avoid the higher pork prices. 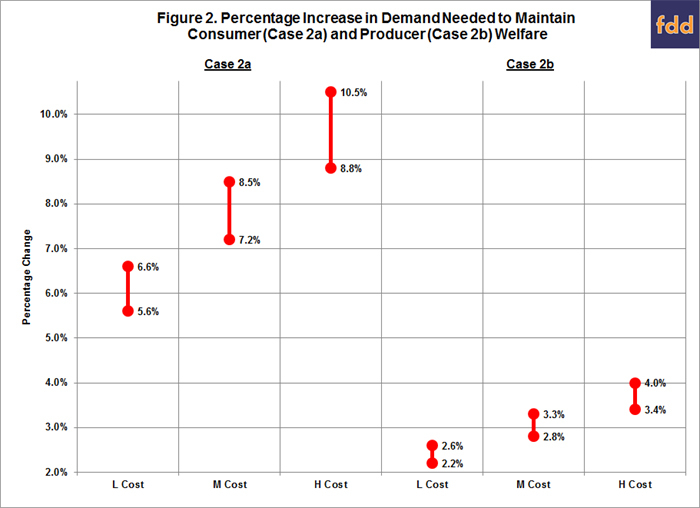 Case 3 is complicated because it requires specifications for both consumers’ incremental willingness to pay for AF pork products and consumers’ costs of switching between different sellers. Several relatively recent studies have examined cost implications of producing hogs without use of antibiotics for GPDP. Based on these studies we utilized, low, medium, and high values of incremental costs of $2.46, $4.21, and $5.95 per cwt. carcass weight. As to incremental processing costs, hog processing facilities need to segregate AF hogs from the conventionally raised hogs. They must also conduct compliance testing and establish traceability and assurance systems. We utilized an estimate by Informa Economics of $4.00/cwt. carcass weight for segregation costs incurred by hog processors in complying with country-of-origin-labeling (COOL). The costs likely will be similar because processors in each case must separate animals with different characteristics and certify that the product sold complies with the indicated characteristic (U.S. origin or raised AF). For case 1 (no demand growth), the retail price paid for pork products by consumers of conventional products decreases slightly because production allocated to this segment of the market increases relative to the share of the market occupied by conventional sellers due to a higher price in the AF segment. The price paid by consumers who patronize sellers of AF pork rises from $10 – $19 per cwt. (4% – 7.4%). Consumer welfare is lower for patrons of sellers of AF pork by from 5% – 9% relative to baseline, depending on the specific scenario (figure 1). Total consumer losses for the no-growth scenario ranged from $150 to $534 million annually. Farmers also lose under the no-growth scenario because total production and farm price decline. Given the relatively elastic farm supply used in the simulation, price falls only slightly, from $0.08 – $0.27 per cwt. carcass weight, and, as illustrated in figure 1, producer net revenue falls by 0.33% to 1.12% ($18 to $60 million annually in 2013 dollars), depending upon cost-of-production scenario. AF producers are exactly compensated for their higher costs, so prices for AF sellers are higher than for conventional sellers by the increase in farm costs. For case 2 we asked how much consumer demand growth was needed for sellers of AF pork so that in aggregate consumers were not harmed. The necessary demand growth ranged from 5.6 to 10.5 percent (figure 2), depending upon the cost-of-production scenario. These growth rates are within the range that experimental studies suggest is plausible, but they exceed any annual demand growth rate that the industry has achieved in the recent past. Some consumers gain and others lose in this setting, with winners being those who now consume the restricted product but chose not to consume conventional pork, and losers being pork consumers who pay more for a product characteristic they don’t value. Farmers gained net revenue (from 0.4% to 1.7%) under any demand-growth scenario that holds overall consumer welfare constant because demand growth increases hog production and prices relative to the baseline. 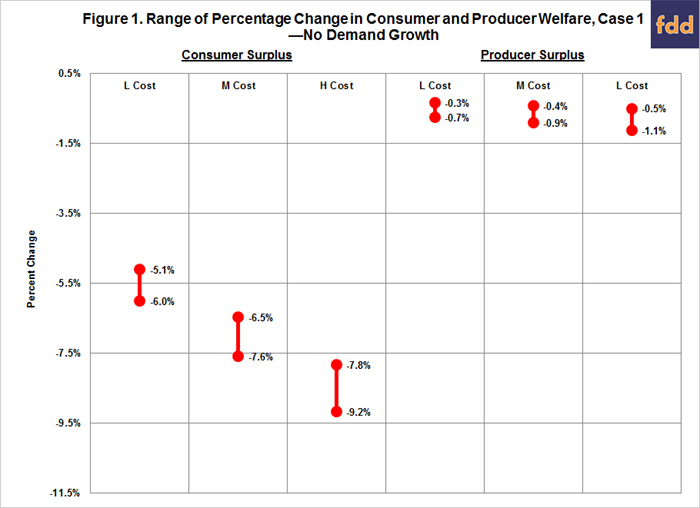 As figure 2 illustrates, a somewhat lower percentage of demand growth in the AF sector, 2.2% – 4.0%, was sufficient to hold producer welfare constant, but this demand growth was insufficient to eliminate consumer loss from sellers requiring AF pork, with the entire loss being borne by consumers in the AF segment of the market. For case 3 we considered two polar scenarios. One in which consumers did not shift among sellers based upon the seller’s pork offerings, and a second scenario in which they could switch freely. In this second scenario, then, every consumer adjusts across pork sellers and products given her preferences and the market prices. We are aware of no studies that would help to define an intermediate case wherein consumers could switch among sellers, but only at a cost. In the no-switching case, there are clear winners and losers among consumers. AF pork consumers pay higher prices, but those AF consumers who highly value the restricted product can increase their welfare substantially. However some consumers who patronize AF sellers will pay a higher price for a product characteristic they don’t value. We estimated that those consumers’ economic welfare would be reduced from $25 – $45 annually, depending on scenario. Patrons of conventional sellers generally lost also due to higher pork prices, but these losses were small for the scenarios simulated. Similarly, producers benefited or lost depending upon whether the total quantity of pork products sold rises or falls. Either outcome is possible because higher sales at AF sellers to customers who highly value the restricted product are balanced against lower sales due to higher prices for consumers who don’t ascribe incremental value to the AF product. In the no-switching case consumers (on average) and all producers lose from key buyers requiring AF pork unless incremental willingness to pay among those who view AF pork as a superior product is substantial or there are relatively large numbers of them in the pork-consuming population. The opposite case wherein consumers can freely switch among sellers is very conducive to welfare gains by consumers, on average, and by all producers when some sellers require AF pork. Consumers who don’t value the enhanced attribute lose due to higher prices, but their losses are easily dominated by gains to consumers who view AF pork as a superior product, even when their share is quite small. Producers benefit because pork sales expand in this subcase. In the absence of demand growth created by sellers requiring antibiotic-free (AF) pork, both pork producers and consumers, in aggregate, lose from this restriction on production practices. Demand growth from new consumers in the AF sector on the order of 6% – 11% is needed to mitigate fully consumer losses, and 2% – 4% growth is required to mitigate fully income losses to hog producers. Because the conventional and AF segments of the market are integrated in production, even significant growth in demand in the AF sector does not increase the relative price premium in the AF segment of the market. Instead a greater share of hog production is converted to AF. Our analysis suggests that either willingness to pay for enhanced meat products reported in the experimental and survey literature is far too high, or the pork industry is missing a huge opportunity to increase sales and profits through aggressive adoption of AF pork. Even with relatively small (5% – 15%) shares of consumers who view AF pork as a superior product to conventional pork, substantial growth in pork sales and revenue is possible if the reported estimates of incremental willingness to pay are accurate. If the estimates of willingness to pay are not accurate (too high), then both hog farmers and consumers of pork product are likely to lose from intermediaries imposing restricting practices because higher production and processing costs will be passed on to final consumers and will reduce sales of pork products.